It's been known for some time that the upcoming Star Wars: The Force Awakens will look to use returning cast members from the classic Original Trilogy to pass the torch to a new set of heroes. However, if rumors about the J.J. Abrams-directed sequel prove true, then the film may also be passing another torch regarding its narrative style to utilize Abrams' signature use of flashbacks. Now, it seems that one strong source of rumors has pointed to an actor being cast as a younger version of an iconic Star Wars character for that very purpose. WARNING: Potential SPOILER material ahead! Seriously, this could be a major reveal if proven true and you have been warned. PROCEED WITH CAUTION! 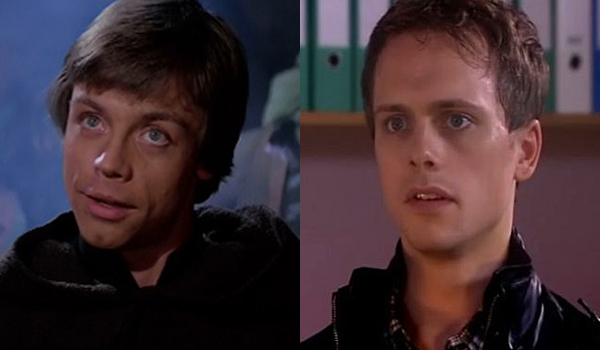 According to a recent report from Making Star Wars, claiming insider access to the production, actor Robert Boulter has been cast in the Star Wars sequel for the role of none other than… Luke Skywalker. Well, a YOUNG Luke Skywalker, anyway. Citing an anonymous tip, the report, seemingly validating their previous claims that The Force Awakens would contain very un-Star-Wars-like flashbacks, indicates that it will feature a young Original Trilogy-era Luke Skywalker. While the report does attempt to discipline itself, qualifying their claim that the casting is not yet "concrete," they do cite the idea that Robert Boulter's name has apparently been swimming around the casting pool for what was said to be "an important role." Additionally, it is claimed that "Young Luke" has been spotted on the film’s master character list, sometimes referred to as the slightly ambiguous pseudonym, "The Young Original Warrior." Certainly, the designation of "original" is especially provocative when coupled with the other rumor that one major character in the film might be Luke’s son. It’s certainly an intriguing, convention-defying possibility that director, J.J. Abrams, a creative mind known for the wanton utilization of flashbacks in several of his past works, would continue that narrative habit. Abrams notably used the story device in the recent film renditions of Star Trek, and habitually as the co-creator of the sci-fi/mystery television island drama, Lost. Abrams is also quite character-centric in his creative approach, though, and coming into a hugely-established franchise like Star Wars, it would make perfect sense that he would want to avoid the same straightforward, no-context approach to the storyline that probably soured prequel launcher Star Wars Episode I: The Phantom Menace from its very beginning. The central theme to The Force Awakens seems to involve the idea of the past and the present colliding, creating a cataclysmic explosion of events. Abrams is known to be a lifelong Star Wars fan and would want to substantively codify the idea that his film is very much the byproduct of the space myth that first managed to capture the imaginations of moviegoers in 1977, changing the broader tone of Hollywood by bringing the fantastical back from the dark pessimistic grit of the 1970’s. Seeing a practical double of a young Luke Skywalker, probably one of cinema’s most iconic protagonists of all time, would certainly be an awe-inspiring moment of nostalgia. Will we get that moment? I guess we’ll have to wait until Star Wars: The Force Awakens flashes its way to theaters on December 18.